A man is elected to the highest office of the land. He is a noble-spirited reformer from a wealthy family, vegetarian and given to such strict celibacy that he will never have a family with his own wife. Some might term his ideals as outrageously “new age”. Sessions are formally held for the president to contact the spirit of departed first executives for advice; there is also talk of channeling going on at the presidential palace. The foregoing paragraph might serve as a blurb for a political novel in which the idealistic elected official comes to a sticky end due to his questing spirit. But this situation actually took place – not in the new age minded Eighties, but in the first decade of the 20th century, when Francisco I. Madero, an avowed spiritist, became president of Mexico after the 1910 revolution. Young Francisco’s idealism had been such that his family always thought he was destined for the priesthood. Having gone to France to further his education, however, he promptly fell into the embrace of the intellectual and esoteric trends of the time. Allan Kardec’s works on spiritism were widely circulated, hermetic and Gnostic associations were rife, and the works of Camile Flammarion and the occultist Papus (Gerard Encausse) were widely circulated. Upon returning to San Pedro de las Colonias in the northern Mexican state of Coahuila, Madero established the Sociedad de Estudios Psíquicos (Society for Psychic Research) and served as its main trance medium and amanuensis. In 1907, the spirit guide known as “José” advised those present at a séance that “a great crusade for democracy” lay ahead for Madero. The rest is history, as they say. Séances had been held in ultra-catholic Mexico since the 1870s, but the Ouija board, patented by Elijah Bond in 1890, represented a new and unfamiliar source of communication with the departed. In the early 1980s, a Mexican priest received an anguished phone call from a young man living in Mexico City’s Popotla District. The youth begged the padre to come to his house, where “something evil” was taking place. The address – given as number 51 Cañitas Street – would become a landmark address in the study of the paranormal. The priest gave the desperate caller a bit of advice: to place an open Bible at the entrance to the home. On the following day, the residents of the house discovered to their horror that the holy book “was weeping blood”, according to statements. Worse yet – at the time this event was discovered, the priest who offered the advice stumbled on the steps of his church and broke his neck. According to the story, the Amityville-like ordeal at 51 Cañitas began with a simple Ouija board session, leading to ghostly apparitions, oppression and even obsession. The story became known thanks to Carlos Trejo, a researcher who was at the center of the Ouija sessions held at that location. The session held in 1982 started out as a gag between friends, although the querent who set the events in motion was none other than Norma Trejo – the researcher’s sister – who asked the board about a former boyfriend, supposedly killed in an accident. The planchette swiveled around, spelling out: Siempre estoy contigo, y ahora me encuentro dentro de Manuel (I am always with you, and now I’m inside Manuel). Manuel, Norma’s current boyfriend, began to contort, his body twisting into impossible postures to everyone’s horror. 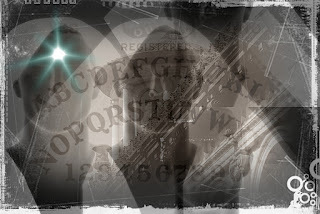 The events set off by the Ouija session sent those present into a “twilight zone” worthy of contemporary Hollywood horror films involving unwary teenagers. A dark presence had seized the home at 51 Cañitas, turning it into a house of horrors in which poltergeist manifestations took turns with demonic obsession. The dark force that caused Manuel to twist into strange and fearsome shapes was driving him mad, while temperatures dropped, friends and relatives experienced possession episodes in which they spoke with strange voices, and objects lurched from one part of the floor to another. Perhaps the most terrifying incident involved a hooded, taloned figure that appeared in the dark, trying to reach Norma. It would haunt the hallways and the rooms occupied the younger members of the Trejo family. The improbable and frightening manifestations would vanish with a mist that would hang in the air after it was gone. According to the story, the Ouija session at Cañitas Street claimed an incredible fourteen lives: first among them, the priest – Padre Tomás – who died upon recommending the use of the Bible. He was followed by Manuel, possessed by the entity, who would die in a car crash with his family; another session-goer died of a bullet-wound during a bar fight; Sofía Trejo, Carlos’s spouse, died of a brain tumor. The list goes on to a tally of fourteen lives supposedly lost to a paranormal incident that began in May 1982. According to Trejo -- seeing that even an exorcism of the property had failed, resulting in a shower of exploding glass windows – the family conducted its own research, discovering that the house had been built on the ancient boneyard of a 16th century monastic order “involved with the Inquisition”. This opens other avenues of inquiry. Far from circumscribed to Europe, the Spanish Inquisition (a source of humor to fans of Monty Python) was very active in its colonial possessions, having been established in Mexico City 1571 by Pedro Moya de Contreras, the High Inquisitor of New Spain. Following the cruel and bloodthirsty code set down by Torquemada, the Mexican Inquisition freely employed torture and confiscation of assets to achieve its purposes. Could the hooded and clawed figure have been, indeed, the spirit of one of these torturers, or one of its victims? The house at 51 Cañitas is located in the city’s Popotla District, one of the oldest, having been part of Aztec Tenochtitlán. In the year 1598, a prison belonging to the Inquisition was built in this general area at the orders of Alonso de Peralta, which also contained a chapel used by religious devotions by the Holy Office, containing portraits of Saint Ildefonsus and Saints Peter and Paul. An inscription can still be found at 5 Perpetua Street which reads: “Under the rule of His Excellency the Count of Monterrey, the Honorable Don Alonso de Peralta who alone attends the court of Inquisition of Mexico City, with his chief architect being Baltazar Mexia, brought water to this building on 8 November 1598” – referring to a supply of potable water channeled in from a nearby spring. As from the 18th century, the Mexican Inquisition was headquartered in the contemporary Palace of Medicine, built in 1732 at Plaza Santo Domingo, where it still stands to this day (http://www.ciudadmexico.com.mx/atractivos/imagenes/palacio_medicina.jpg). Restoration of its cells is ongoing. The original buildings and outlying structures may, as Carlos Trejo suggests, have been in the area occupied by 51 Cañitas and other dwellings.